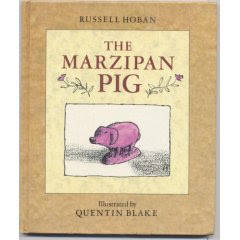 One of my favorite children's books is The Marzipan Pig by Russell Hoban. We originally fell in love with this from a great short animated video, narrated by Tim Curry. 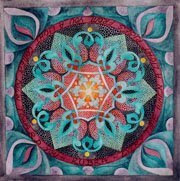 The way the story moves in layers, with glimpses of each from the others, is enchanting, as are the images and dialogue. The story's cadences are hypnotic, especially in the hands of a master like Tim Curry. I love to read this book aloud, more than almost any other. 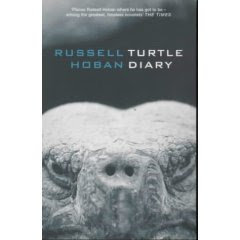 Several years ago I read Turtle Diary. I had always thought of Hoban as an author of children's books, and was surprised to find his name on the cover. I enjoyed the unusual double story, and found the characters believably ordinary and extraordinary at the same time. Like The Marzipan Pig, there are layers on layers, and some are just suggested. You catch throw-away glimpses of characters who will suddenly be the main focus later, and when they show up you have a brief flash of recognition, and a thread is woven instantly from where you were before to where the book is taking you now. While other authors do this, there is something unique about the moments and characters Hoban uses to spin these connections. There are so many vivid little details, and you could probably recognize many of them again later, but he only chooses a few to make the connections. Somehow they seem unlikely choices - until he's done it, and then they seem inevitable. It makes you mentally blink when it happens, bringing you to a brief pleasant stop before you plunge back into the now noticeably deeper story. 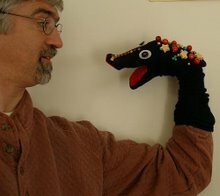 You are also left with the feeling that ANY of the other details might have been brought to life and connection, as well. The best thing, for me, in reading Turtle Diary, was that images and details from The Marzipan Pig appear! The taxis queued up by the Prince Albert Bridge. The trains rumbling on the peaceful common. I expected at any moment the characters would pass by number 6, the house where the marzipan pig lived, seeing the owl asleep in the plane tree. I felt the two stories happen over and under each other, woven into a larger fabric spanning adult concerns and children's topics. Not only do the characters all seem to inhabit the same acres of physical space, but both books are about love, loss, longing, and renewed hope for the future. Turtle Diary captures something I've long believed about providence. We work like it's all our own doing and, if we're paying attention, we might catch Hoban-like glimpses of what is really going on. You know, that's precisely what I've been trying to say about those little interconnecting details in Hoban's books. They're familiar precisely because they have the same odd glow of intervention. It takes a light touch to capture that golden color.